While the original Cyclepaths team members first rode together in the second year of the annual Eastern North Carolina MS Bike Tour in 1990, they did not appear as an official team until 1993, when they won the Best Team Name Award. Retired Cyclepath Darlene Creech is credited with coming up with the team name. 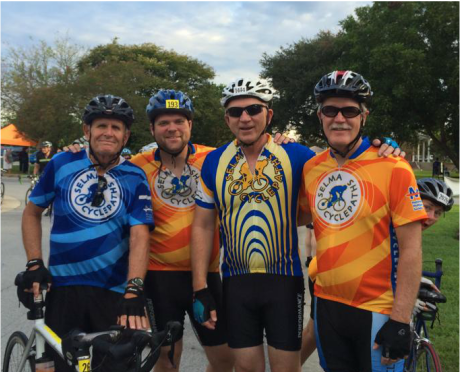 While the Cyclepaths have raised a lot of money for the National Multiple Sclerosis Society, the team members also have enjoyed the friendships and the April-to-September team training rides. Each training ride is fully supported by volunteer Support and Gear vehicle (SAG wagon) drivers and is meticulously charted in map and cue sheet formats. Captain Emeritus and team founder, Dave Holmes, first rode in the Tour in 1990 and completed his 25th MS Bike Tour at age 77 in 2016. Ken Williams rode with Captain Dave in those early years before the Cyclepaths were the Cyclepaths. Judge Bob Bryant, is another early team member who continues to ride with the Cyclepaths. Bob has ridden in 26 Tours, first in support of and now in memory of his brother Larry, who passed away from complications related to MS in 2008. Larry was the inspiration for the team. Dave, Bob, Ken Williams, Tom Andrews and Lynn Burleson have ridden in twenty or more North Carolina MS Bike Tours. Tom Andrews joined the team in 2005 and has ridden in 23 Tours. He was the top individual fundraiser in 2013, 2015, and 2016, raising $23,420, $24,222 and $22,720 respectively. Through the 2016 Tour, Tom has raised a jaw-dropping $225,000. Tom will be 80 years old by the time the 2018 Tour arrives and as always, he will ride 150 miles over the weekend- no more and no less. While the average age of the personalities listed above may be in the upper 60’s, most of the Cyclepaths are in their 30’s and 40’s. There have also been high school aged cyclists riding with the team. The team watched Cyclepaths Bill and Cole Warren’s children, Hunter and Issac, grow up on the team, first as volunteers for the Tour and then as cyclists. By having three separate routes of three separate distances for each training ride, Cyclepaths of all ages and abilities are usually able to find riding companions of comparable abilities. While the Cyclepaths are a team, they are not a racing team, not that some of the stronger riders can’t hold their own with the speedsters of Bike MS. The Cyclepaths have been fortunate to have had great team captains over the years. Captain Dave Holmes founded the team and led it through its first decade. Captain Dave did everything for the team during those years, including mapping the training ride routes long before the availability of GPS devices. Bob Bryant, Lynn Burleson, Gaines Weaver, Jenny Bradley, Cole Warren and Cindy Chastang are other Cyclepaths who have stepped forward to captain the team. A debt of gratitude is due each and every one. It was under Lynn’s leadership in 2003 when the team exploded from 3 to 64 riders and from $5,700 to $57,000 in contributions in a single year. Two years later, the team raised over $100,000 and has accomplished that feat nearly every year thereafter. Many team members have stepped up to handle specific duties during a season such as the scheduling of the SAG wagon drivers and the actual driving of the SAG wagons for training rides. Cyclepath Tommy Fitzgerald, owner of the Grocery Bag in Clayton, has been very generous in allowing us to store our coolers and fill them with ice from the back of his store at the training ride staging area. Becky Flowers has also been generous in allowing us to start our training rides on Flowers Plantation property for almost the entire history of the team. Richard Hibbits has been handling the route master duties for a number of years and carefully maps out the three routes for each of the Saturday morning training rides from April until the Tour in September. Richard and his Cyclepath wife Ford have hosted the annual summer potluck Cyclepaths dinner for many years, giving the Cyclepaths the opportunity to socialize off of the bike and to meet non-cyclist significant others. Additional leaders are in the making as the Cyclepaths move towards a committee leadership approach to "all things cycling" for the team. The team is focused on team cycling and fundraising for the 2018 season. All are welcome to join us for the team cycling aspect and/or the fundraising efforts. 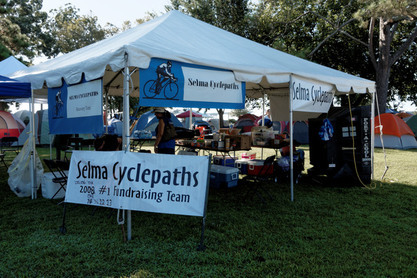 The Selma Cyclepaths will always be a fundraising team. Don't be surprised if you come to ride with the team that you wind up fundraising to help stop MS. Most of the team did exactly that! The Cyclepaths have a way of growing on you and the next thing you know, you'll be having fun in New Bern in September as your raised funds help someone in need. Since becoming an official team in 1993, the Cyclepaths have registered as few as three riders and as many as one hundred twenty in a single year. Cyclepaths fundraising totals have been as little as $1,520 and as much as $134,452. The Cyclepaths have had one fourth-place finish, two third-place finishes, four second-place finishes and nine first-place finishes. 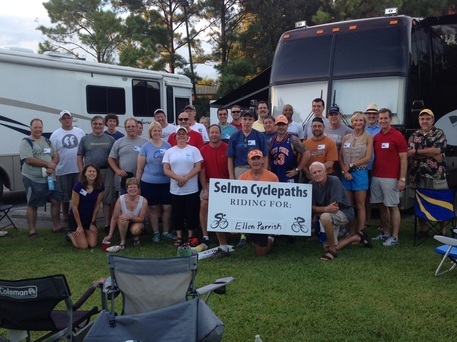 Going into the 2018 Tour, the Selma Cyclepaths have raised in excess of $1.6M in support of MS research and programs.